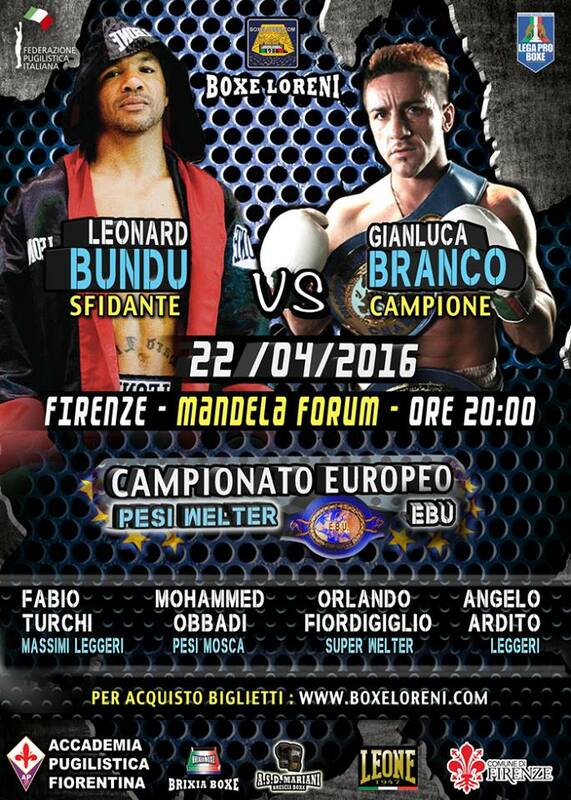 The all-Italian fight between reigning EBU welter champ Gianluca Branco, 43 and 49-3-1, and official challenger Leonardo Bundu, 41 and 32-1-2 , is now set for the Mandela Forum in Florence April 22. Superwelter Orlando Fiordigiglio (23-1) appears in the chief support. Branco was all set – or so it was reported – to defend the title against Paulie Malignaggi December 12 but pulled out shortly before due to an injury even if it was later reported that Gianluca withdrew from the fight long before but that never reached the UK promoters. Either way, Branco is now promoted by Giulio Spagnoli and trained by Mario Massai. The fight against Bundu will be his first since winning the title in November 2014. Branco vs Bundo is promoted by Boxe Loreni.